Home » » DVD Info: Release date, bonus features announced for American Gangster. 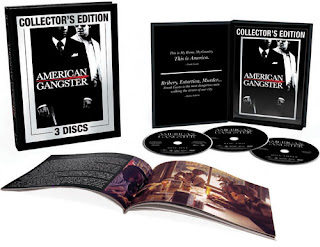 DVD Info: Release date, bonus features announced for American Gangster. 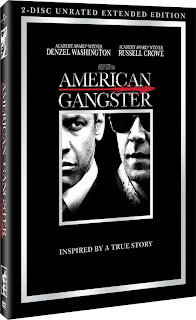 Universal Studios Home Entertainment has announced the details for the DVD release of American Gangster. There will be two different sets, one 2-disc & one 3-disc. Both will be released on Feb 19th, 2008. *Script Meeting: A look into the production office where director Ridley Scott, writer Steven Zaillian, and detective Richie Roberts discuss the script and break down of the scenes. The 2-disc set will have a SRP of $29.98 and the 3-disc will be $34.98.